The Essentia website ("Essentia") is solely owned, operated and controlled by Arche Systems located in San Diego, CA 92110. Copyright © 1996-2016 Arche Systems, San Diego, CA U.S.A. All rights reserved. 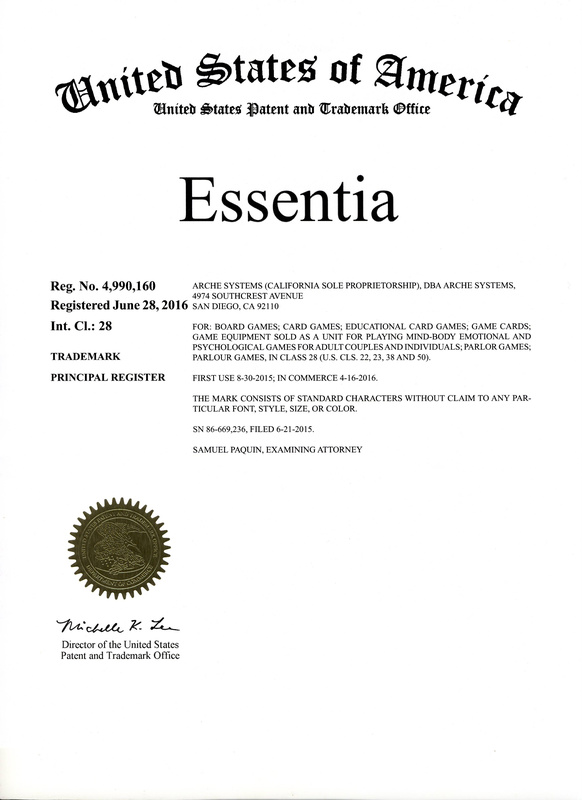 The Essentia website ("Essentia") is protected by copyright laws and international copyright treaties, as well as other intellectual property laws and treaties. "The Essentia Discovery Deck", "The Essentia Challenge Deck", The Essentia Atom", and "The Essentia Network" referenced herein is either a trademark or registered trademark of Arche Systems (US Registration Number 4,990,160). Other product and company names mentioned herein may be the trademarks of their respective owners. Permission to use Documents (such as web page text, graphics and informational files) from this website ("Website") is granted, provided that use of such Documents from this Website is for informational and non-commercial or personal use only and will not be copied or posted on any network computer or broadcast in any media. Arche Systems reserves the right to revoke such authorization at any time, and any such use shall be discontinued immediately upon written notice from Arche Systems. Use for any other purpose is expressly prohibited by law, and may result in severe civil and criminal penalties. Violators will be prosecuted to the maximum extent possible. Documents specified above do not include the design or layout of the Essentia website or any other Arche Systems owned, operated, licensed or controlled site. Elements of the Essentia website are protected by trade dress and other laws and may not be copied or imitated in whole or in part. No logo, graphic, sound or image from any Essentia website may be copied or retransmitted unless expressly permitted by Arche Systems. ARCHE SYSTEMS MAKE NO REPRESENTATIONS ABOUT THE SUITABILITY OF THE INFORMATION CONTAINED IN THE DOCUMENTS AND RELATED GRAPHICS PUBLISHED ON THIS WEBSITE FOR ANY PURPOSE. ALL SUCH DOCUMENTS AND RELATED GRAPHICS ARE PROVIDED "AS IS" WITHOUT WARRANTY OF ANY KIND. REFERENCES TO CORPORATIONS, THEIR SERVICES AND PRODUCTS, ARE PROVIDED "AS IS" WITHOUT WARRANTY OF ANY KIND, EITHER EXPRESSED OR IMPLIED. IN NO EVENT SHALL ADOBE SYSTEMS INCORPORATED BE LIABLE FOR ANY SPECIAL, INCIDENTAL, INDIRECT OR CONSEQUENTIAL DAMAGES OF ANY KIND, OR ANY DAMAGES WHATSOEVER, INCLUDING, WITHOUT LIMITATION, THOSE RESULTING FROM LOSS OF USE, DATA OR PROFITS, WHETHER OR NOT ADVISED OF THE POSSIBILITY OF DAMAGE, AND ON ANY THEORY OF LIABILITY, ARISING OUT OF OR IN CONNECTION WITH THE USE OR PERFORMANCE OF THIS INFORMATION. NOTICES REGARDING DOCUMENTS AND SERVICES AVAILABLE ON THIS WEBSITE. IN NO EVENT SHALL ARCHE SYSTEMS BE LIABLE FOR ANY SPECIAL, INDIRECT OR CONSEQUENTIAL DAMAGES OR ANY DAMAGES WHATSOEVER RESULTING FROM LOSS OF USE, DATA OR PROFITS, WHETHER IN AN ACTION OF CONTRACT, NEGLIGENCE OR OTHER TORTIOUS ACTION, ARISING OUT OF OR IN CONNECTION WITH THE USE OF DOCUMENTS, PROVISION OF OR FAILURE TO PROVIDE SERVICES, OR INFORMATION AVAILABLE FROM THIS WEBSITE. Arche Systems has provided links and pointers to Internet sites maintained by third parties. Neither Arche Systems or it's service provider(s) operate or control in any respect any information, products or services on these third-party sites. Arche Systems is not responsible for the content of any linked site or any link contained in a linked site, or any changes or update to such sites and the inclusion of any link does not imply endorsement by Arche Systems of the site. The materials in this site and the third-party sites are provided “as is” and without warranties of any kind either express or implied. To the fullest extent permissible pursuant to applicable law, Arche Systems disclaims all warranties, express or implied, including, but not limited to, implied warranties of merchantability and fitness for a particular purpose. Arche Systems does not warrant that the functions contained in the materials will be uninterrupted or error-free, that defects will be corrected, or that this site, or the server that makes it available, are free of viruses or other harmful components. Arche Systems does not warrant or make any representations regarding the use or the results of the use of the materials in this site or in third-party sites in terms of their correctness, accuracy, timeliness, reliability or otherwise. Arche Systems reserves the right to deny membership in the Essentia Network to any user, and reserves the right to remove any member's record from the Essentia website. This action is at the sole discretion of Arche System and may be done without any explanation or justification. Any user who engages in the practice of spamming, uses Atoms in the Essentia Network for the sole purpose of advertising commercial sites, creates multiple duplicate Atoms, or in any other way abuses the system will be removed immediately. Users have the right to free expression of their beliefs and practices, but users who use the Essentia Network with malice against other users, or are purposely offensive, are likely to be removed. We explicitly ask when we need information that personally identifies you ("Personal Information"). For example, Essentia asks you for your name and e-mail address when joining The Essentia Network. We use your Personal Information to operate The Essentia Network, and to occasionally contact you when necessary. This information is not made available to anyone other than the webmaster, and remains protected within the Essentia website. Should you or any user of this website respond with information, feedback, data, questions, comments, suggestions or the like regarding Essentia, any such response shall be confidential and Arche Systems shall not reproduce, disclose or distribute the response to others without explicit permission. The use of the Email relay feature of The Essentia Network to send email to another member is deemed explicit permission. You agree that Arche Systems shall be free to use any ideas, concepts or techniques contained in your response for any purpose whatsoever including, but not limited to, developing, manufacturing and marketing products incorporating such ideas, concepts or techniques. In the future we may need to place a text file called a "cookie" in the browser files of your computer. The cookie enables the Website to recognize information that you have specifically and knowingly provided to Essentia. Currently, cookies are not being used. Under no circumstances, including, but not limited to, negligence, shall Arche Systems or it's service provider(s) be liable for any direct, indirect, incidental, special or consequential damages that result from the use of, or the inability to use, Essentia materials. You specifically acknowledge and agree that Arche Systems is not liable for any defamatory, offensive or illegal conduct of any user. If you are dissatisfied with any Arche Systems material, or with any of Arche Systems’s terms and conditions, your sole and exclusive remedy is to discontinue using Essentia. This agreement is effective until terminated by Arche Systems, at any time without notice. In the event of termination, you are no longer authorized to access the the Essentia Network and the restrictions imposed on you with respect to the use of the Essentia Network, the disclaimers and limitations of liabilities set forth in this agreement, shall survive.